Artifacts are being found in a long-sealed tunnel found under the ruins of Teotihuacan which may lead to the discovery of an ancient tomb. TEOTIHUACAN, Mexico -- A long-sealed tunnel has been found under the ruins of Teotihuacan -- and chambers that seem to branch off it may hold the tombs of some of the ancient city's early rulers, archaeologists said Tuesday. Experts say a tomb discovery would be significant because the social structure of Teotihuacan remains a mystery after nearly 100 years of archaeological exploration at the site, which is best known for the towering Pyramids of the Moon and the Sun. No depiction of a ruler, or the tomb of a monarch, has ever been found, setting the metropolis apart from other pre-Hispanic cultures that deified their rulers. Archaeologists had suspected the hidden tunnel was there after a heavy rainstorm in 2003 caused the ground to sink at the foot of the Temple of Quetzacoatl, in the central ceremonial area of the ruins just north of Mexico City. Starting last year, they began digging, and after eight months of excavation, they reached the roof of the tunnel last month, 40 feet (12 meters) below the surface. They lowered a small camera into the 12-foot-wide (4-meter) corridor, which had been carved out of the rock early in Teotihuacan's history, and got the first glimpse of the space that they say was intentionally closed off between A.D. 200 and 250. "I think the tunnel was the central element, the main element around which the rest of the ceremonial center was built," archaeologist Sergio Gomez said. "This was the most sacred place." The camera showed the tunnel appearing to extend about 37 yards (meters) before it is blocked by a wall or mound. Ground-penetrating scanner images found the tunnel extends beyond the blockage and ends in a large chamber that measures 10 yard (meters) on each side, lying almost directly beneath the temple. Two smaller chambers appear on either side of the rough-hewn corridor. All the signs point to it being a ruler's tomb, Gomez said, including the rich offerings tossed into the tunnel at the moment it was closed up: almost 50,000 objects of jade, stone, shell and pottery, including ceramic beakers of a kind never found before at the site. 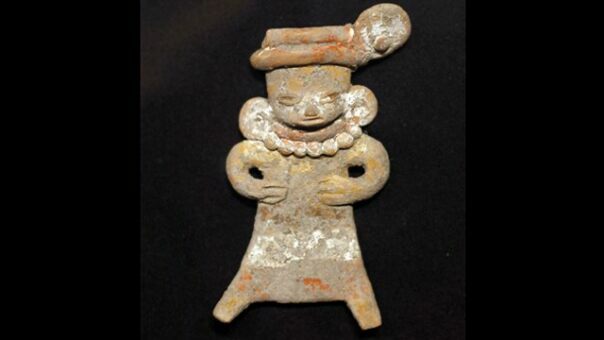 "Up to now, every archaeologist who has worked in Teotihuacan has tried to find the tombs of the rulers," Gomez said. "There is a high possibility that in this place, in the central chamber, we can find the remains of those who ruled Teotihuacan," he added. , plazas, temples and avenues was once the center of a city of more than 100,000 inhabitants and may have been the largest and most influential city in pre-Hispanic North America at the time. Nearly 2,500 years after the city was founded -- and about 2,100 years after the Teotihuacan culture began to flourish there -- the identity of its rulers remains a mystery. The city was built by a relatively little-known culture that reached its height between 100 B.C. and A.D. 750. It was abandoned by the time the Aztecs arrived in the area in the 1300s and gave it the name "Teotihuacan," which means "the place where men become gods." Luis Barba, of the Anthropological Research Institute of Mexico's National Autonomous University, said that because there are no images, names or other references to rulers among Teotihuacan's rich murals and stone carvings, some experts suggest the city might have had a shared leadership, with rulers alternating between its four precincts. "People have looked for these rulers for many years," Barba said. "Perhaps they will be found now. There is nothing to rule it out or make it impossible, but at this point, we have nothing." Gomez said it will take at least two more months of digging before archaeologists can actually enter the tunnel. This dig is unimaginable. Even in more recent years when ancient south and central american sites like Tiahuanaco were exhausted and then made into antiquated stomping grounds for fringe Draconian tourists, this excavation in Mexico could be a turning point in how the archeaology world gets the resurgence it needs.